The visual field is understood to mean the area that is perceived optically while a person stares straight ahead at a fixed point. A visual field test is a functional analysis that measures whether any deficiencies or restrictions exist in the visual field. The test takes several minutes. The patient is usually placed in a separate quiet, dark room to prevent distraction from noise. Only one eye is tested at a time, while the other eye is covered with an eye patch. The result of the visual field test greatly depends on the patient’s cooperation and concentration. This test is frequently tiring and time-consuming for the patient, but it is the only method for actively measuring the visual function. 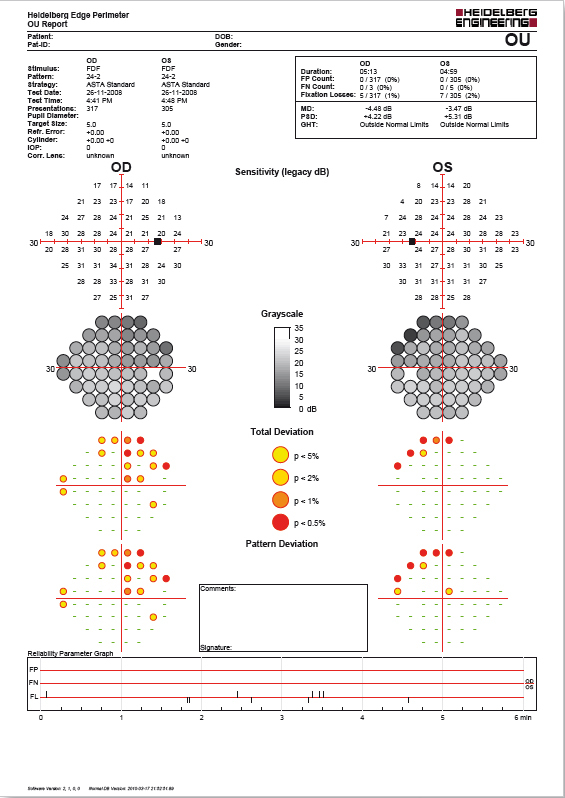 Standard automated perimetry (SAP) is the most frequently used method around the world for measuring the visual field. It measures how sensitively the retina reacts to light stimuli at certain points. Flicker defined form (FDF) perimetry is a completely new method for early detection of glaucoma and is offered only on the Heidelberg Edge Perimeter (HEP). A stimulus is presented as a circular area that flickers in contrast with the background. A patient with a functional visual system will perceive the illusion of a gray ring along the edge of the stimulus. The active cooperation of the patient is required in every visual field test. During the entire test, the patient stares at a fixed point in the middle of a screen or a projection surface. Test stimuli or light stimuli are displayed in random order at different positions and at different intensity. When patients notice a light stimulus, they push a button. If the button is not pushed for a light stimulus, first the intensity is increased. If the person still does not perceive the stimulus, the computer records a visual field deficiency at that position and continues at another position in the visual field. 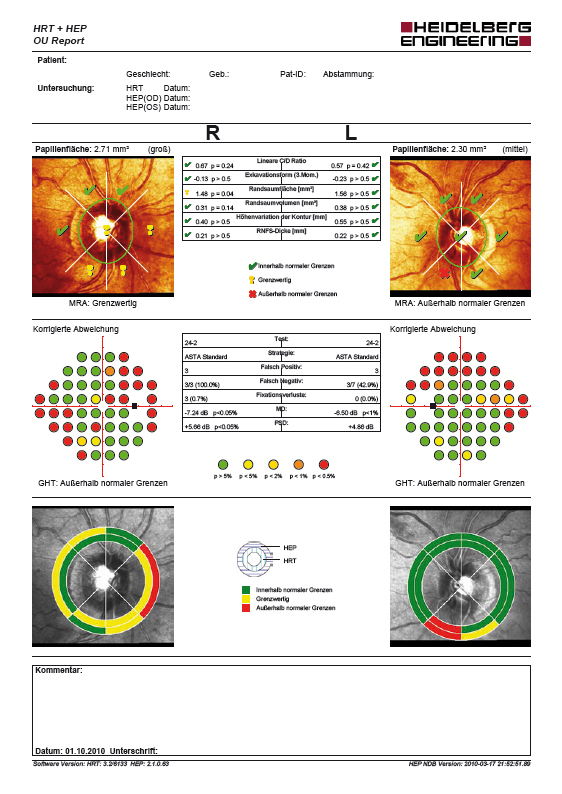 At the end, the test result is compared with a database of standardised normal results and indicates a value for each test position in the visual field.